Vienna is a hip-happenin' place to be. Do you know the fastest way from Amsterdam to Ankara? What about from Madrid to Vienna? The answer given in Ticket to Ride First Journey is, of course, by train. But can you get there faster than your friends? 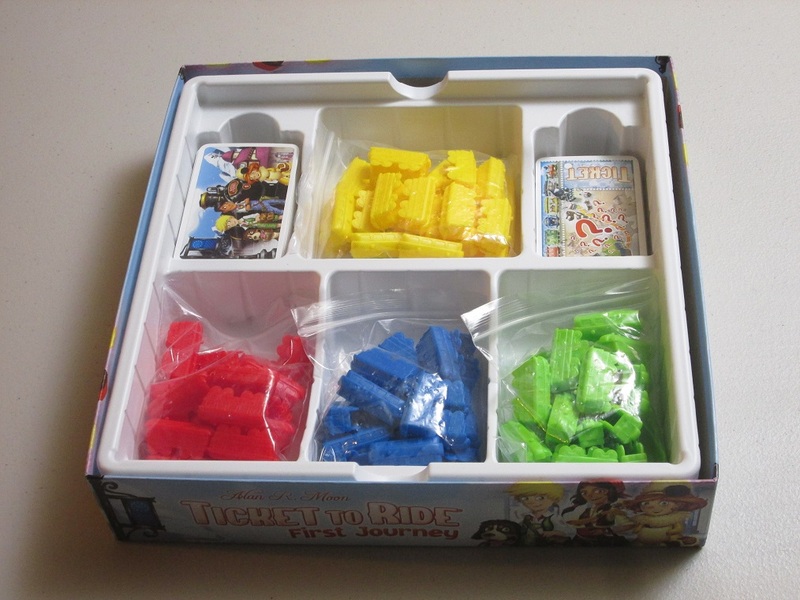 Ticket to Ride: First Journey is a set collection/network building game for two to four players. 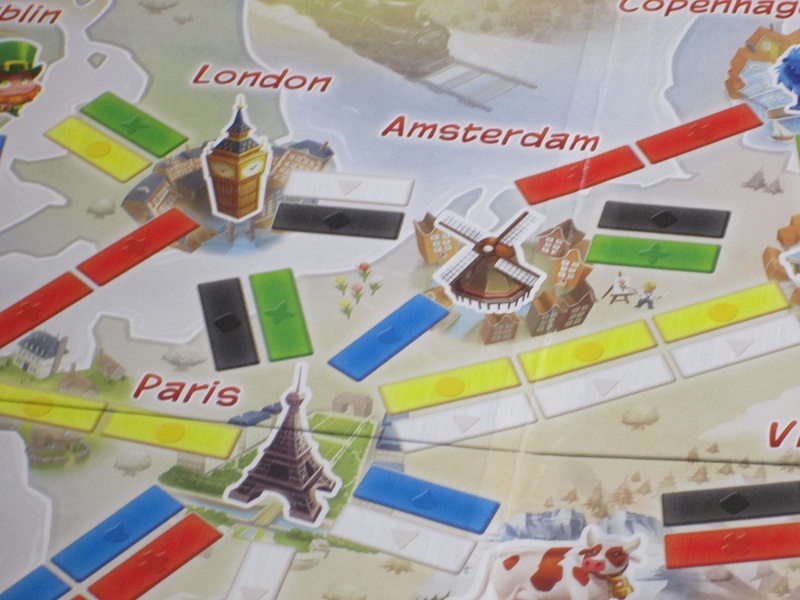 Players are trying to connect cities on the board with their trains to claim destination tickets. The first player to complete six destination tickets wins. 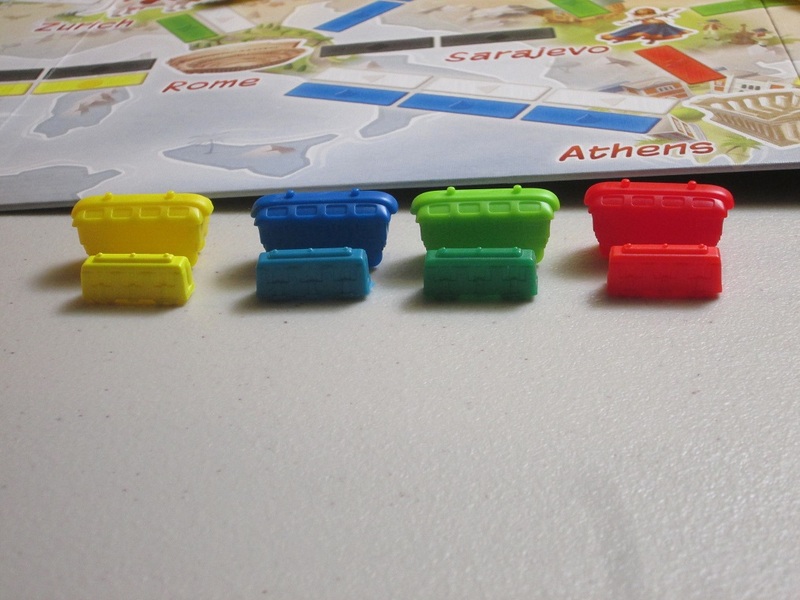 To begin, each player gets all the trains of a color. The board is placed in the center of the table, and the decks of train cards and destination tickets are shuffled. 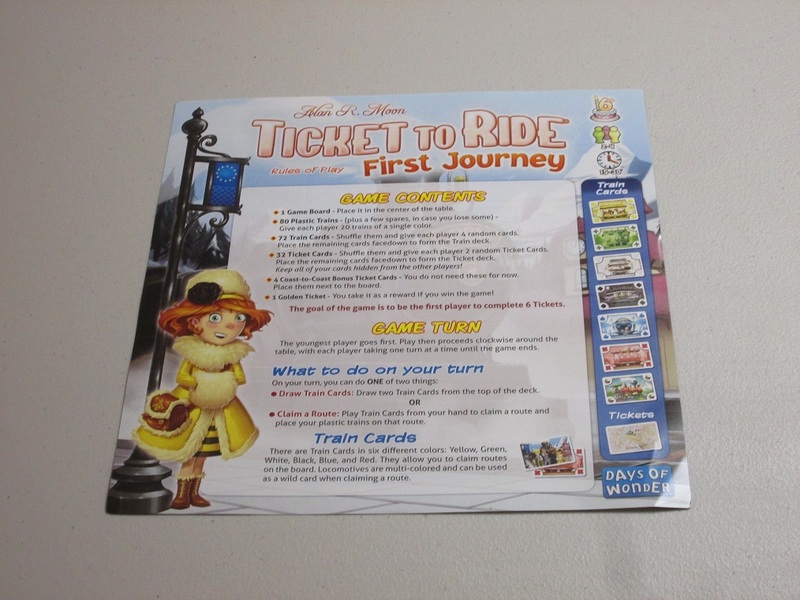 Each player receives four train cards and two tickets and play begins. 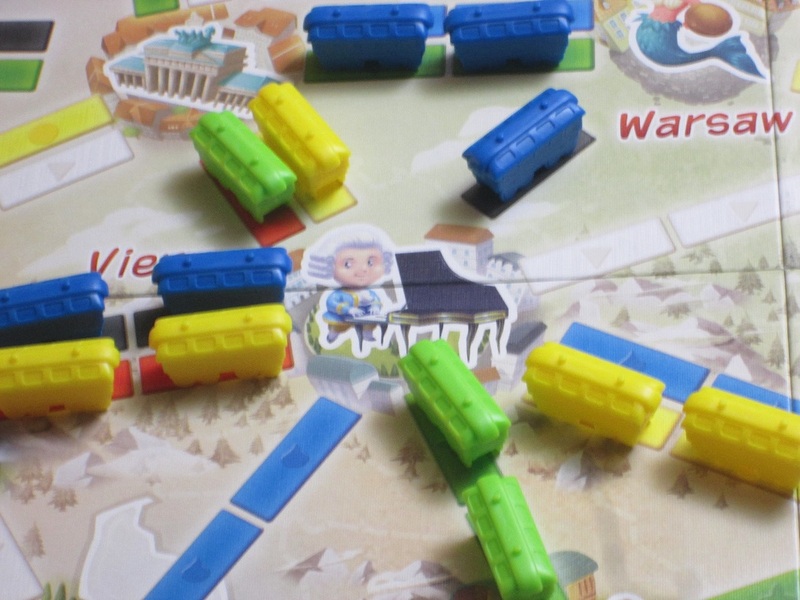 When a player has two or fewer trains left in their stock, each player (including the player who just placed trains) takes one more turn. Alternatively, when one player has claimed their sixth ticket, the game ends immediately. The player who has completed the most tickets wins. Playing games with the kids is more often than I’d like to admit a concession. Either we’re playing something that is objectively unfun, or one of the children is being a sore winner/loser or not paying attention. In either case, it can be excruciating as you watch the minute hand–tick, tick–ever so slowly make its way around the clock, finally pronouncing either the end of the game or bedtime, a mercy in either case. So I’m grateful for children’s games that don’t make me dislike my children or time spent with them. In this regard, Ticket to Ride: First Journey is a huge success. Vienna is a hip-happenin’ place to be. When it was first announced that Ticket to Ride Junior would be released, the prevailing opinion on Board Game Geek was a smug, “Isn’t the regular board game Ticket to Ride Junior?” My response to that is, yes: maybe if your kids are playing Agricola in diapers, Ticket to Ride might be simple enough for your kids to play at a young age. For the rest of us, Ticket to Ride: First Journey is just the game we’ve been looking for–simple enough that kids can understand it, beautiful enough to hold their attention, and interesting enough that their parents aren’t slowly dying inside. What makes Ticket to Ride: First Journey succeed is the way it streamlines the original game. Again, I know it can be hard for hobbyists to understand, but Ticket to Ride isn’t quite as simple as we take it for. I remember teaching it to a family member some years back, explaining and re-explaining the rules, and having her say after we’d finished playing, “I like that, but that’s about as complex a game as I can handle.” And it really is kind of complex when you first approach it: you have to plan ahead, think on your feet, gather the right resources, and spend those resources at the right time. You need to connect the cities on your tickets in such a way not just to complete those tickets but to put you in a position to draw more tickets that might benefit you (without making you go in the hole), all while possibly trying to create the longest contiguous rail segment. Here’s where I’m going this time. First Journey keeps what makes Ticket to Ride so compelling–gathering cards, playing them at the right time, and connecting cities–while removing the extraneous stuff that can complicate the game for young and old players alike. First, players only have to contend with two tickets at a time. They don’t have to choose how many they’ll go for and risk taking negative points. There are two tickets, with these four destinations, and the whole goal is simple: be the first to complete a set number of tickets. Then there’s the train card market. Instead of choosing which train cards to take from a market of five, when you draw train cards, you just take the top two cards from the deck. This may seem like less control–and it is–but it also removes a lot of the thinking time where the game can bog down and it simplifies the rules about refreshing the market or taking a face-up locomotive card, a boon especially for the young. It also puts young and old players on a similar footing: all are bound to the vagaries of luck. The rules are one sheet, front and back, and well illustrated. 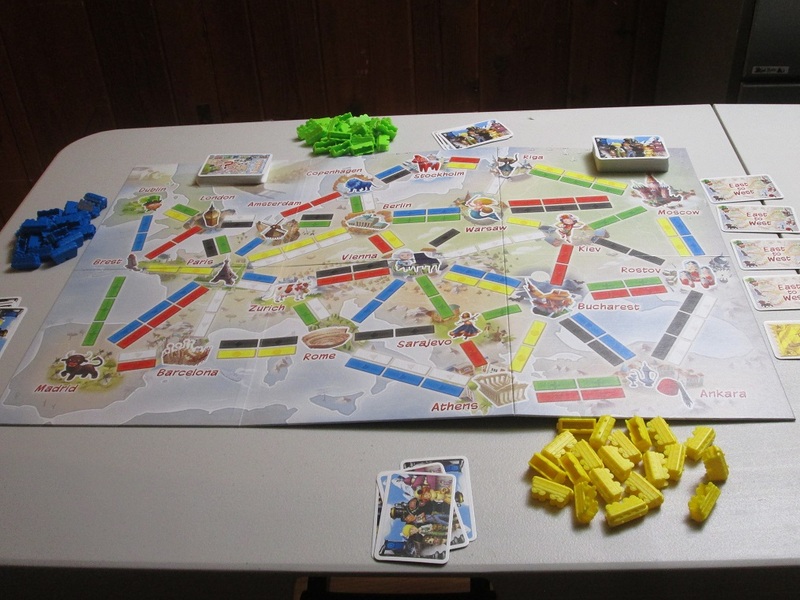 Instead of trying to get the longest train segment, players can earn a “free” ticket if they connect the two edges of the board–something to go for in its own right, but more likely an incidental bonus players can claim by virtue of playing the game. I will be the first to say that I like regular Ticket to Ride better, and when the kids are in bed, I won’t be bringing First Journey back to the table. Yet First Journey retains enough of the spark of Ticket to Ride that it doesn’t feel like much of a concession to play this, and it also has lots of clever usability differences from Ticket to Ride that give kids enough autonomy that parents aren’t just “managing” the game for the children. Each city being represented by a name and a landmark is a wonderful usability upgrade for children. 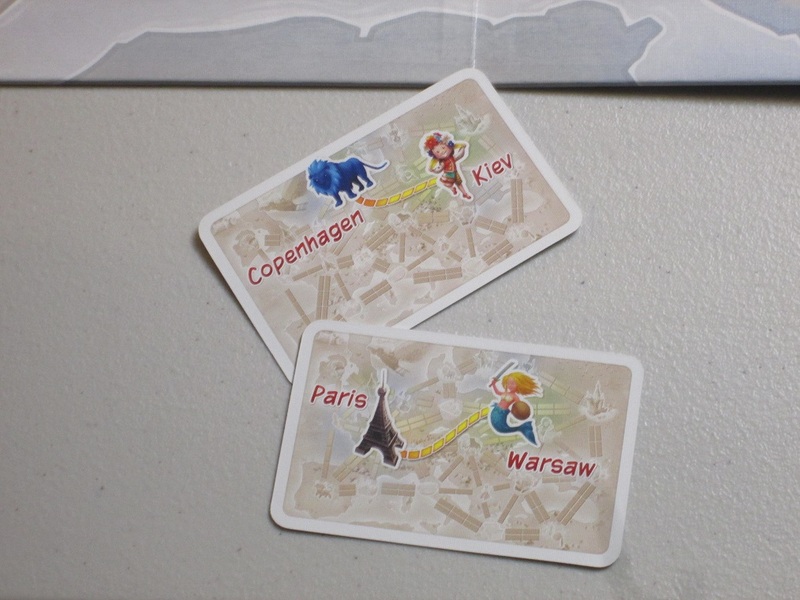 One of the things I love the most about First Journey is that each city on the map is represented by a name and also an identifying landmark, and both name and landmark appear on each ticket for each destination. I’ve played First Journey primarily with my four- and six-year-old kids. My six-year-old is a good reader, and he doesn’t need the landmark pictures, but for him, the landmarks are a good way to help him learn about the different cities on the map. He may not know much about Paris or Rome, but he can see the Eiffel Tower and the Colosseum and ask questions about them. My four-year-old can read a little, but unfamiliar place names would be a challenge for her. Because of the landmarks, she can easily identify where she needs to go on her tickets. This is a simple change, but it’s a great one for kids. The trains in First Journey are in the back, Ticket to Ride trains are in the front. First Journey’s map also has larger spaces to hold trains because the included trains are larger than in regular Ticket to Ride. Again, this shouldn’t seem like a big deal, but the larger trains are easier for my kids to manipulate and place on the board themselves. It isn’t necessary for me to step in and place pieces for them; they can handle this themselves, and I like that First Journey feels like a step toward future board game autonomy. Yes, some of the strategy points elude them, and I sometimes offer strategic advice, but this is the kind of game they can play now and grow into the more they play. I like that. It seems hardly worth including in the game, yet alone worth mentioning, but Days of Wonders’ typical attention to detail is shown in the inclusion of a “golden ticket” for the winner. Yes, I know–this is completely unnecessary. Why include a badge for the winner? As soon as the game is over, you know who the winner is. Doesn’t that come with its own glory? In a rational, adult universe, yes, this is unnecessary, but it’s hard to overstate how excited my kids get when they see what they’re playing for–a golden ticket! They might be thinking of Willy Wonka or The Polar Express or any number of things that are promised by this small piece of faux-shiny cardboard. I’m not certain. What I do know is that the golden ticket serves as a tangible promise of future glory, a reminder of why we’re playing the game in the first place. This is great. 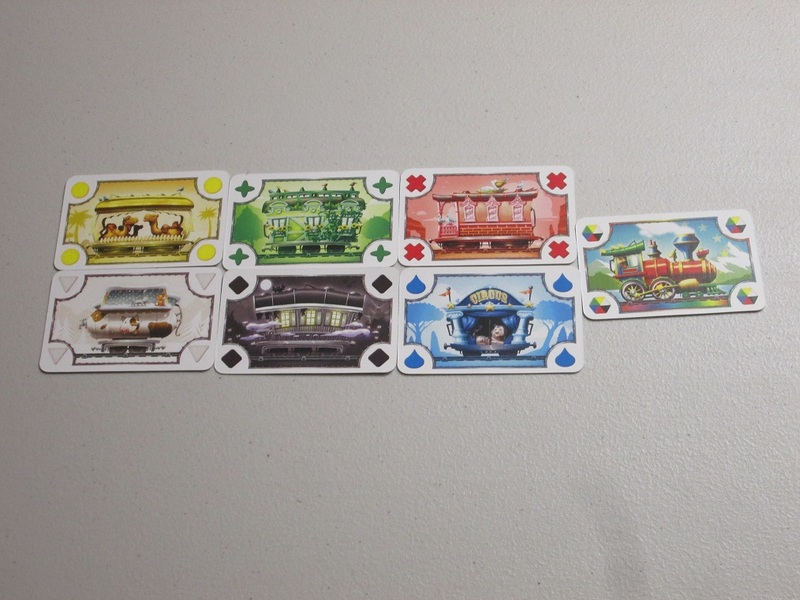 The train cards are colorful and look great. My kids especially like the milk tanker on the white train card. 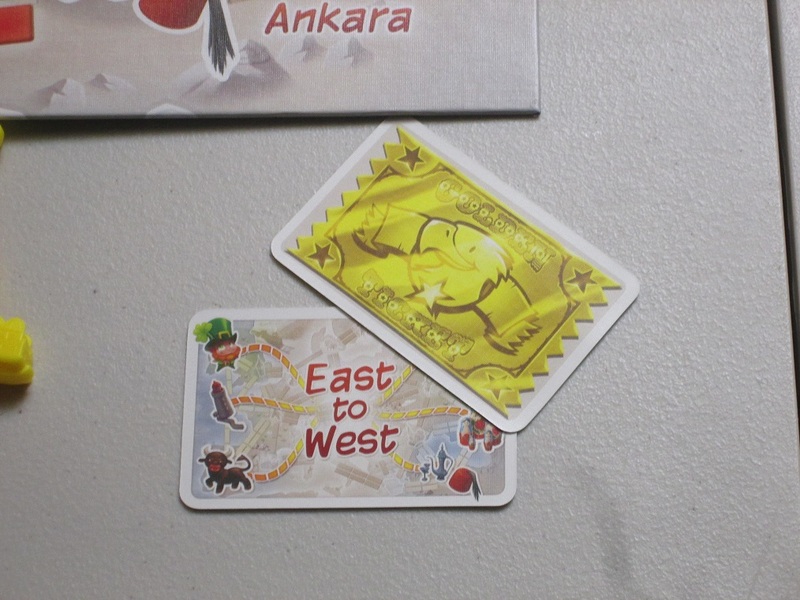 As for gameplay, if you’ve played Ticket to Ride, you know most of how it feels to play First Journey: you’re collecting cards to place trains to complete routes and hopefully claim the track you need before your competition. While the rules are simplified in this edition, First Journey feels a lot like adult Ticket to Ride. The strategy is a lot easier for younger minds to parse, and the components are tailored to children. The fact that the game retains as much Ticket to Ride feeling as it does is a triumph for parents who are tired of Uno. The insert is top quality, as we’ve come to expect from Days of Wonder. 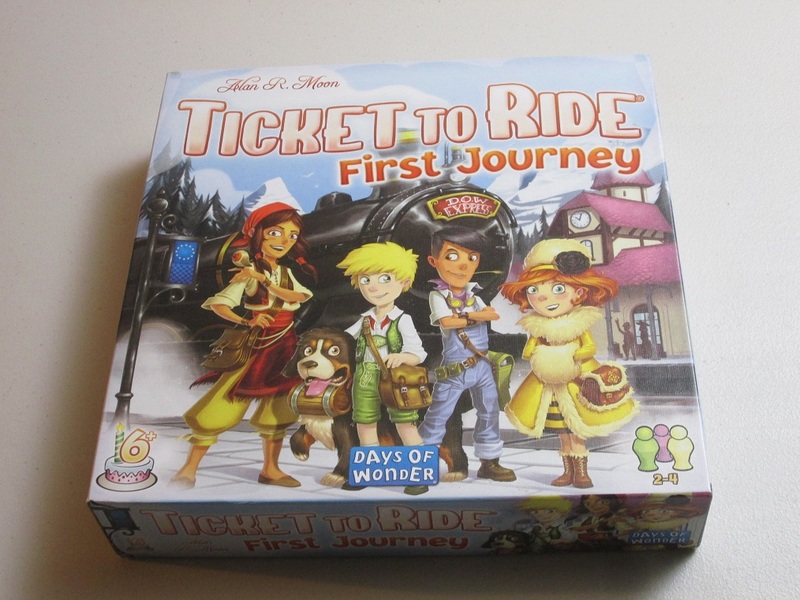 That’s not to say that Ticket to Ride: First Journey will make gamers out of your kids, or that it will keep them from squabbling, or that magically, when a golden ticket is on the line, your kids will become good winners and good losers. Unfortunately, there’s no magic bullet for those lessons, and as far as I can tell, there’s no shortcut to the top of that mountain. It comes through consistent practice, play, and modeling good behavior. It’s just a lot easier to put in the time to reach those milestones when the underlying game is a good one. And Ticket to Ride: First Journey is a good one.